I cannot believe you didnt change the water pump ! It works so hard and when it starts to leek or scream it will cost you a BOMB to change because it is the same procedure as a new timing belt ! You cannot save money by going the cheapest way Guys ! Valves, guides, seal...... Rs.4-5000/- sorry don't have the exact amount. My father, very graciously did the buying, as I was at work. Water pump of good quality not available. hence not changed. tough luck. Will have to go through the routine again. I read each and every post on this thread, now I am dead scared about my 1.6GLX exactly 4yrs old and 68k KM without changing the timing belt, accesories belt, water pump, gaskets etc. 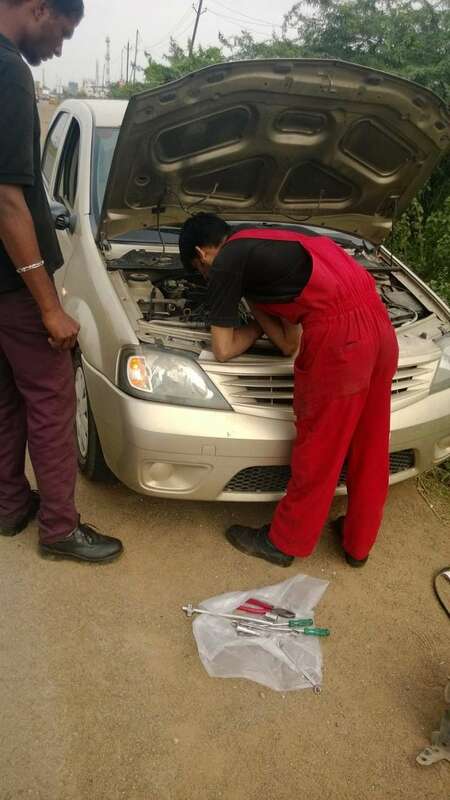 one more query, earlier when I used to stop my car the cooling fan used to rotate for some time, but for past one year there are no signs of cooling fan rotation after engine is turned off, even after 400km long drive, I didnt hear that running of cooling fan, Any views on this. Finally got the timing belt and accessory belt replaced, total cost including tax ₹8128 (€110), out of which labour cost was ₹1500 rest was spare parts cost. my service advisor was not at all convinced to replace water pump, he said in Logan he has never changed for any car in part 3years. hence I did not argue. Now I feel safe to drive, without the fear of massive breakdown on highway. 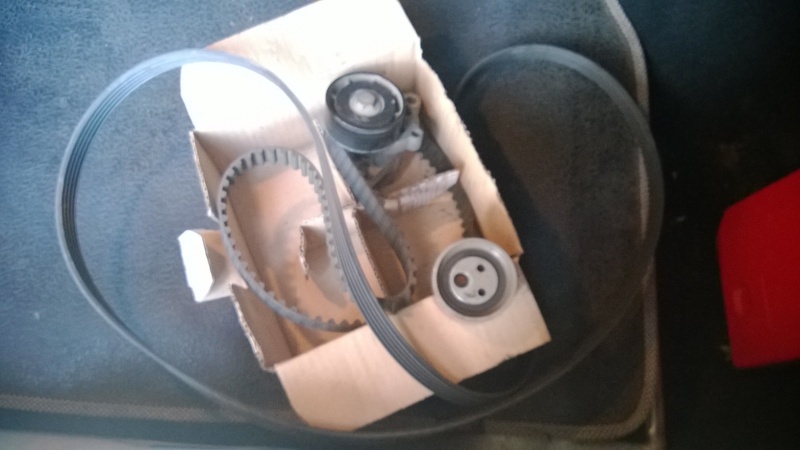 Hi all, would like to know if in alternator pulley there is a little play would it be recommended to change it. Just seen its 6 years old !!!! WHY DID YOU NOT GET IT CHANGED !!! Thanx fr such a prompt reply. After my last service had hardly used this car. hence didnt want to spend much. Even as timing belts have never been on anyone's topmost prioritized to do list for such low kms. for any diesel vehicles, I suppose from now on all you Loganizers take the timing belt issue serious atleast for your logans as I have burnt my hands. 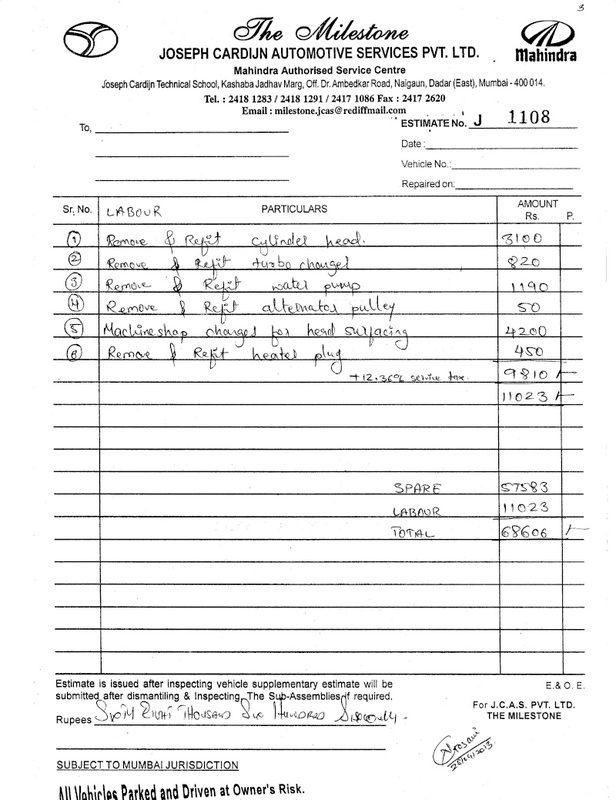 Martin if you notice on the estimates sent to me from Milestone, the tensioner should come along with the timing belt kit. 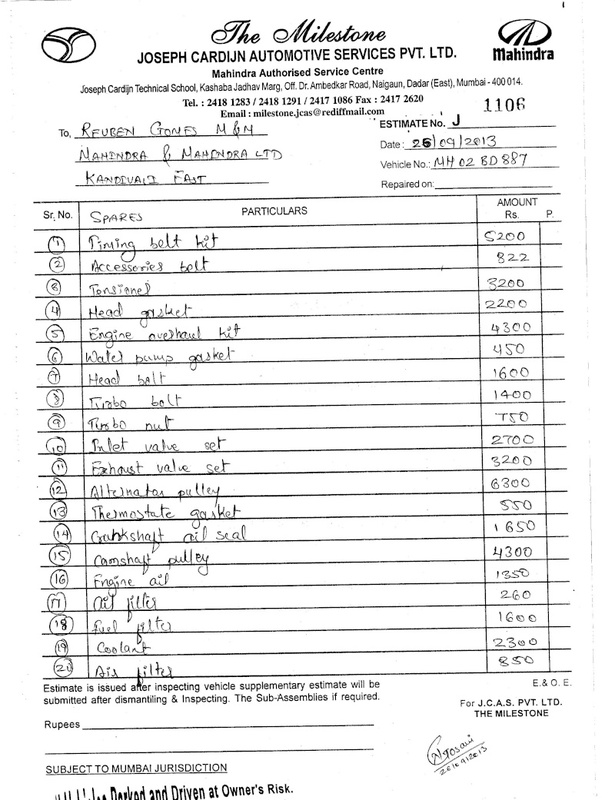 also what is the 'heater plug' as it is also listed in another list sent separately and cost about Rs.6300/-? Hi, Today morning I heard some abnormal noise from the Engine hood, then stopped to look for the trouble and shocked to see the Accessory Belt is tearing which was replace just couple of months back, It was half cut, not yet fully snapped, I parked the car aside and called the service center and they are arranging to get the car towed till the service center 25km away. here is the photo of the cut belt. Latest update, the belt was replaced on the road itself by the workshop guys, No need to Tow the vehicle with workshop. Vehicle back to normal, shall take it to workshop in the evening for thorough check up. Also need to fight with the Dealer for 6 months warranty claim on the Mahindra Spares. 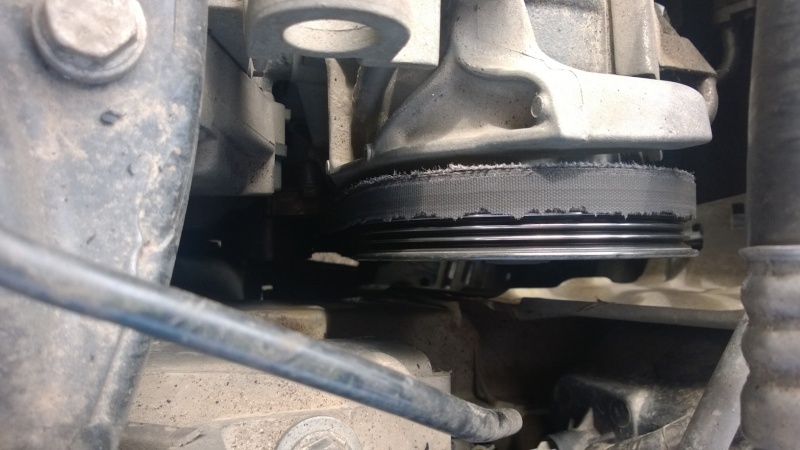 Thats an alternator belt its not the timing belt !!!! 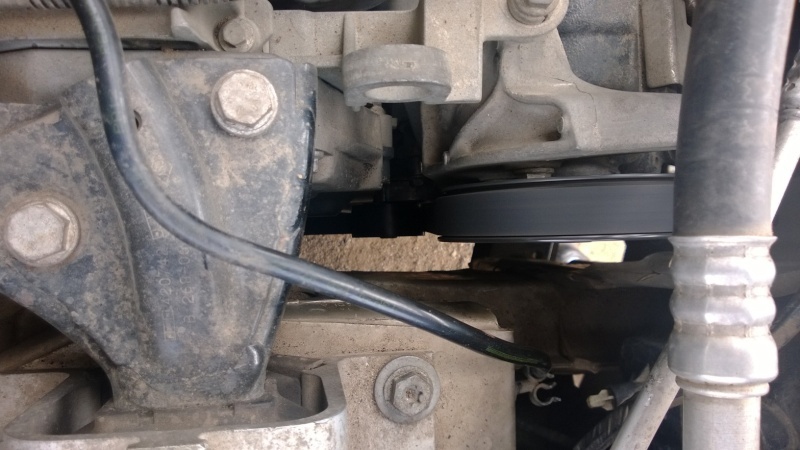 Yup its an alternator belt also connecting the lower steering and AC compressor. I tried updating in the same thread where previously posted the timing + alternator belt replacement. about the tool kit, I am glad the guys came for resque in time and they also used my floor mats to get under the car. My logan has now completing 4 years and did 26000kms is it necessary to change the timing belt. When i check the belt no wear and tear in my inspection and the service centre people 2 months back told me that no need to change now later will change. Now tempeature will increase day by day due to summer so please tell me when i should change it. Took the car for service today as it had crossed 51,311 on the odo. Also nearing 7 years in September. Told the service adviser to change the timing belt as i did not want to push my luck. Happy with the car for the last 6 years and 8 months, did not want any issues to come up. So getting the timing belt replaced, i also asked them to replace the water pump. The supervisor said no need to change that as it lasts long and was asking if there is any leakage. Also that if there is a issue it can be changed just 3 blots need to be removed. I told him there is no leakage, but i want to get both changed together so i do not have a issue for the next 5 years. After lot of persuasion and luckily the had the water pump in stock, he agreed to change the same. Did not want to take a risk as most of the times they never found the water pump in stock. So took the call and getting both received as Stu has strongly recommended this, we do not have much kms on the odo but my parents love the car and want to keep it for at least 3 more years if not more. Let's see what the final bill comes out to be. The have increased the service charges. Coming up to Rs 2215 and another 400 for washing and cleaning. They have special discount of 15% labour and 5% on parts so taking advantage of that. Hope this resolves most of the stuff and there is nothing else to worry about. » 4 cycle honda trimmer?